Oh hey Saturday, you're looking awfully wonderful today! It's Day 6 of the Spring 2017 10x10 Challenge hosted by Un-Fancy and Style Bee. If you want to know more about it, you can get info and inspo here. I'll actually be doing this challenge for a total of 15 days (10 days left starting today) so jump on board with me now if you want! Weather: Pretty in Colorado today, sunny and in the 60s. It will drop down to the 40s tonight. Work/Activities: PJs all morning while I do laundry and then to karate. Right after that it's go, go, go. A birthday lunch with father-in-law (Happy Birthday Earl! ), errands, coffee with my friend Megan who is in town from Arizona, and then dinner at a friend's to meet the new boyfriend... who is giving me a scoby to make my own kombucha, yay!! Wear/Washability: Can't go wrong with these jeggings by Spanx. They keep that "just washed fit" right out of the wash and even after you wear a few times. The Zebra shirt needs to be taken out of the dryer right away so it doesn't wrinkle. The tank is cotton so it has the tendency to get fuzzies after a couple wears but the fit has held up great. TANK OVER SHIRT? I don't normally wear a tank over a tshirt but when you only have 10 pieces, why not? I actually like the way this look turned out. 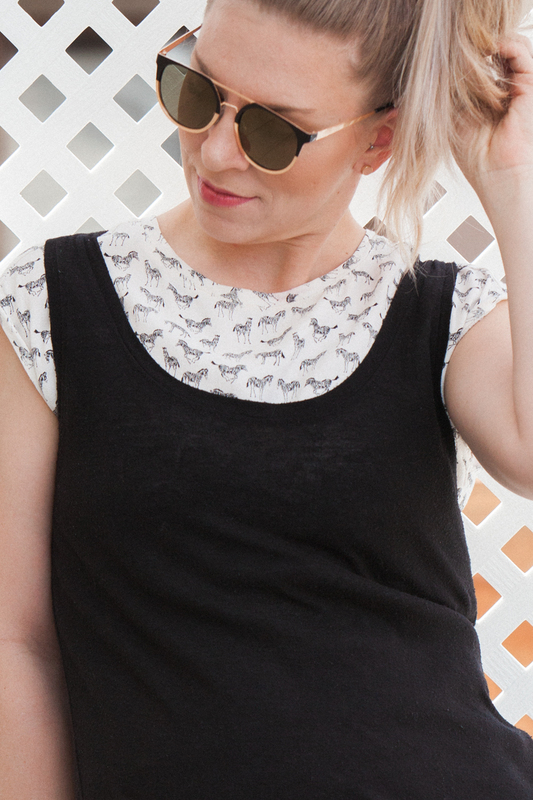 Great note for future: Pick tanks and shirts that can be layered various ways. TO TUCK OR NOT TO TUCK When it comes to casual comfort, I like my shirts untucked. However, tucking gives shape to a triangle, rectangle, and hour glass figure. HAIR UP, YOU STUDS! I like to wear hair up with this to show off the necklines. Pair it with some pretty studs for earrings. Or for a night out, wear a dangly earring.